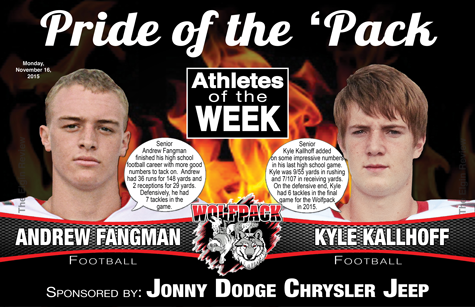 The Elgin Review’s final football Pride of the Pack-Athletes of the Week have been chosen. Rounding out the season are seniors Andrew Fangman and Kyle Kallhoff. Both athletes were close in the tallies of their stats for the final game of their high school career. Andrew had 36 runs for 148 yards and 2 receptions for 29 yards. Defensively, he had 7 tackles in the game. Kyle was 9/55 yards in rushing and 7/107 in receiving yards. On the defensive end of the ball, Kyle had 6 tackles. While the season ended earlier that many hoped for and expected, what a great year the team had. Thanks to each and every Wolfpack football player for all your hard work in practice and on the field at games. This week’s players were sponsored by Jonny Dodge Chrysler Jeep of Neligh.